Counting the herd: The system counts the herd every 5 or X minutes inside the Coverage of the pole-range. If one cattle is missed the system sends an SMS to the herdsman about the cattle’s ID that missing. Geo-Fence: The system provide indication if all the cattle are inside the digital fence (limited to the range based on pole coverage) and sends SMS to herdsman when cattle come to cross the Geo-Fence. The SMS contain cattle's ID number and link to the map with the location of the cattle. Theft and hostile events: if there is an attempt to cut or remove the collar or attack the cattle, the system sends an SMS with the location of the event to the herdsman while presenting it as a" push" on his smartphone. Cattle physiological behavior: the system identified cattle's behavior like: walking, running grazing, jumping, laying, in-heat and others behavior statistic. Cattle finder: dedicate Mobile application to find cattle in distress or went loss. When herd is roaming from one grazing area to another dedicate satellite collar is mount on few cattle of the herd to control the herd during the roaming. 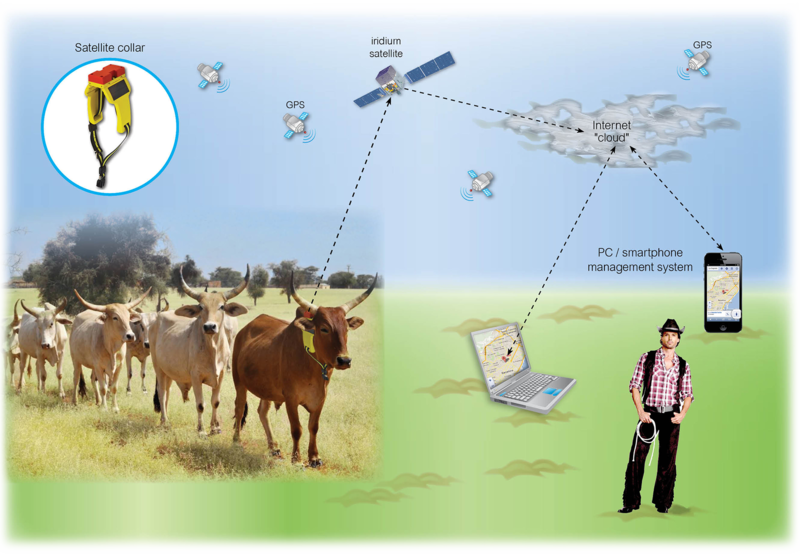 Herdsman can get location of every cattle by using the smartphone or PC application to query herd or animal location. Owner can get location of the herd while roaming using dedicate s/w application on his smart phone.